Students work across disciplines to solve industry challenges at the Walton College's first Blockchain Hackathon. 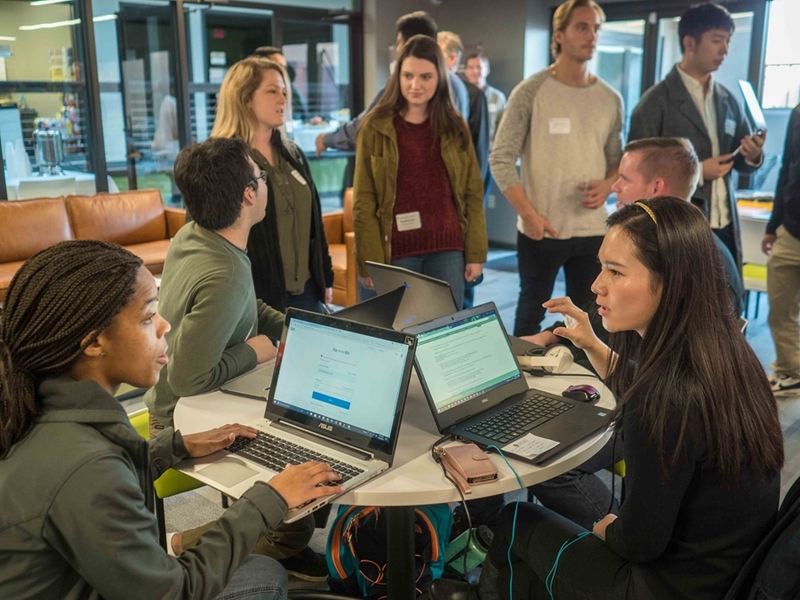 On Oct. 27-28, students from disciplines across the university formed problem-solving hackathon teams to learn the latest blockchain technology and take on business-case challenges from Walmart, Tyson Foods and J.B. Hunt Transport Inc. The students ranged in experience from freshmen to doctoral candidates and came from the Sam M. Walton College of Business, J. William Fulbright College of Arts and Sciences, Dale Bumpers College of Agriculture, Food and Life Sciences, and the Graduate School and International Education. "We could not have hoped for a better outcome," said Zach Steelman, assistant professor in the Department of Information Systems at the Walton College and the driving force behind the university's first blockchain hackathon. "The teams and sponsoring companies joined forces to devise new ways of using blockchain to benefit a variety of industries using different, unique solutions to actual business challenges." Company sponsors were IBM, ArcBest, J.B. Hunt Transport Inc., Tyson Foods and Walmart. Blockchain involves encrypted sets of transactions in which an accounting ledger of verified events are distributed across multiple networked computer systems producing a block of data. "Blockchain technology offers a secure, verifiable way to maintain an encrypted accounting ledger of business transactions," Steelman said. On Friday night, students formed 13 teams of five students each and decided which of six use case they would work on. Teams were encouraged to have a mix of disciplines represented in their makeup to be able to comprehensively deal with the business-based challenges. The teams then worked on their solutions Friday evening and early Saturday morning until late afternoon when each one presented a unique solution to its use case. Each team had a mix of blockchain novices and those more experienced with the emerging technology. The work took place in meeting spaces at the new Brewer Family Entrepreneurship Hub just west of the downtown Fayetteville Square. Also on hand to lend expertise and support were expert teams from each of the sponsoring companies and faculty and staff from the Walton College Department of Information Systems. Industry experts said blockchain has the potential to drastically alter how businesses interact with partners and customers by building trust into transactions. "This could significantly alter the way business does business, and the University of Arkansas is quickly becoming a leader in this technology," said Paul Cronan, professor and M.D. Matthews Endowed Chair in the Walton College information systems department.